This time last year, the Peninsula Hotel was deep in its search for a new chef for Avenues, a process that, in the Chicago restaurant scene, is a little like the hunt for the Dalai Lama. Avenues doesn’t just hire chefs; it launches them. The Peninsula was looking for its next Graham Elliot. The search focused on a chef named Lee Wolen. At the time, Wolen was a sous chef at Eleven Madison Park in New York, but he had put in time here at Moto and Butter, and, in between, at Spain’s famed El Bulli. For a chef who wanted to come back to Chicago, there is probably no greater pull than Avenues. So when he was offered the job, he accepted. The plan was to rehab Avenues from top to bottom—not just the food but also the room. But then, the plan changed. The Peninsula, responding to pleas for more event space, decided to turn Avenues into a wedding hall. That left Wolen with the Lobby—the Peninsula’s least-revered space, the one tossed off as a place for guests to eat pancakes. I’m guessing this was a little soul-crushing for the chef. But I’ll also posit the Lobby might have been an unexpected gift. Wolen doesn’t come from the Graham Elliot or Curtis Duffy school of food—he is less infatuated with visual tricks and powders—and had he taken over Avenues, the inevitable comparisons would have muddled the conversation about Wolen’s food. And in the Lobby—which of course is both the literal lobby of the Peninsula Hotel but also a beautiful space unlike any other hotel lobby in the city—he has to balance the reality of hotel guests patronizing the hotel’s most accessible restaurant for a light supper with his own ambitions to put out the best food in Chicago. This is a balance that is working out in the chef’s favor—my recent meals at the Lobby have been more satisfying than any I ever had at Avenues. Wolen’s food is deeply delicious and palpably soulful. It quiets cravings that live deep in the trenches of the belly, and does it with astonishing grace. You can see this in his carrot salad, where the sweet, roasted vegetable is presented with puréed raisins and bulgur wheat, half of which has been fried to achieve the addictive pop of Rice Krispies. It’s in his scallops: Wolen offsets the butteriness of the bivalves, which have never been cooked to more precision, by setting them in an orange urchin broth. It may as well be a bowl of delicious seawater. Wolen’s lamb is slowly roasted at a low 250 degrees until it achieves the tenderness of something that has been cooked sous vide, and his sea bass, also slow roasted, arrives surrounded by various accoutrements: candied fennel, roasted fennel, Meyer lemon puree, juicy olives. It’s essentially four dishes here, a fresh experience every time a new combination gets on your fork, and each one is remarkable. Yet none of these entrées compares to the chicken for two. The thing is a spectacle: Like at New York’s Nomad, it’s stuffed with herbs and shown off to the table before being carried back into the kitchen to be carved. 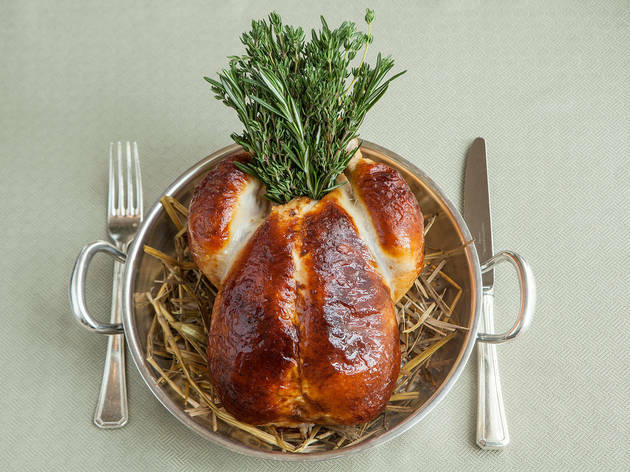 Then it comes back as a perfect breast, stuffed under the skin with butter and brioche, with roasted apples and some chocolate-enriched chicken jus on the plate. 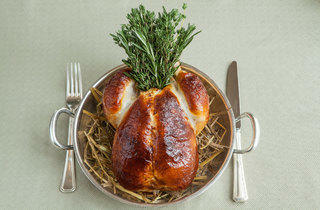 It tastes as insanely delicious as it looks, and you think it’s the best chicken you’ve ever had. But then, a few minutes later, a tiny cast-iron crock of dark meat, tossed with chives and a little cream, arrives, and suddenly the best chicken you’ve ever eaten has just gotten better. What could follow such a dish? Innumerable wonderful moments precede it: the Lobby’s bread-and-butter service (gorgeous baguettes and bacon rolls paired with two butters—the herb-salted goat butter is the better of the two); interactions with the Peninsula’s polished staff; a toothsome, housemade mushroom tagliolini that exploits every savory, woodsy note wild mushrooms have to offer. But following the chicken is a harder task, and the Lobby’s desserts aren’t up to it. A tiny peanut-butter cake paired with candied celery and grape sorbet; an almond semifreddo alongside fresh and poached figs—I appreciated these plates for their subtlety, for bucking the trend of desserts that hit you over the head. But I also was relieved when a plate of mignardises arrived post-dessert because it gave me a sugar fix that actually satisfied (it was a dark chocolate truffle with a peanut-butter center that did the trick). Yes, by the time those truffles arrive, you’ll barely be able to eat. It’s just part of the deal here. Once, halfway through my first meal at the Lobby, I tried to hold myself back. Reasoning there was more food on its way, I told my companions that of the three gnocchi that were on the plates in front of each of us, we should eat only one. “Yeaaaaah, no,” one companion said, defying me by eating a second gnocchi. “Sorry!” said the other, who followed suit. Minutes later, my plate was empty, too. Logic has no sway over these dumplings, which have centers of molten ricotta and burst in the mouth like berries. And just like practically everything else at the Lobby, there was simply no way to say no.